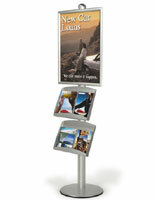 Snap Frames : This poster stand is double-sided! Create eye-catching presentations with products from SnapFrames.com! The display rack, or double-sided display stand, is easy to use and stylish, too. This double-sided display stand consists of two 22" x 28" aluminum poster frames and two large literature trays mounted onto a 6ft aluminum banner pole. The double-sided display stand's brushed aluminum frames and powder coated steel literature trays slide easily into the pole's two tracks. Position the retail display accessories on your double-sided display stand at your desired height and tighten the provided screws and anchors. 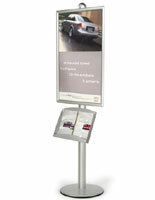 Snap frames make this double-sided display stand, also called a poster stand, even more desirable for ease of use. 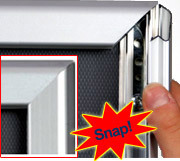 You can load and unload your retail display signs simply by snapping open the frames sides. 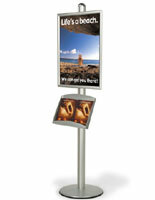 There is no need to remove the frames from the poster stand, also known as a display stand. 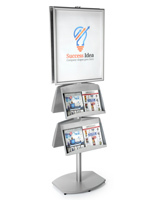 This double-sided display stand is a strong floor display with a wide, heavy duty base. 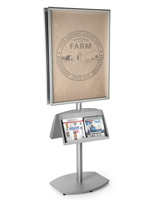 You can position these display stands anywhere in your store, or showroom without worry. A double-sided display stand like this floor display rack marries together design and function with its stylish looks and large display areas. Buy this double-sided display stand and load it with your literature. The literature trays are approximately 13 inches high, and 18 inches wide with an inch of depth, leaving you ample room to display standard 8 ½ x 11 size pieces of literature side by side, or oversized brochures or magazines in each tray. 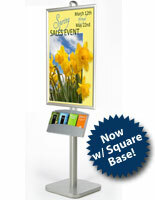 You won't want to own any other display stands once you get your hands on this modular double-sided display stand. 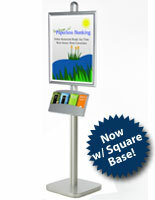 **This double-sided display stand is intended for indoor use only.